Extremely flexible and compressible. 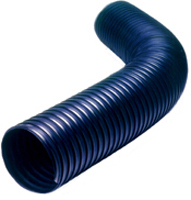 Crush resistant duct with excellent shape retention. Enhanced chemical resistance of TPR with an extremely smooth interior for superior flow. Heavy duty external wear strip protects against abrasion, but will not scuff or mark surfaces. No wire. Industrial and residential duct cleaning. In-plant dust control; shop vacuum systems. Temperature range: -60°F to +250°F. Weight: 1.8 lbs - 8” diam. Lengths: 25 & 50 ft. up to 8”, 10”-25 ft.
Colour: Black with black external wear strip.